← Decatur Active Living: Agency of the Year! Join MARTA Police Department for an Informational Self-Defense Class this Saturday at Decatur Recreation Center. 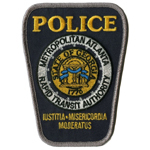 MARTA Police are offering free self-defense classes as part of a sexual assault awareness campaign to help customers remain safe on the transit system. The transit agency is also encouraging people to communicate with other riders through the hashtags, #BlowtheWhistle, #MARTACares and #EnoughisEnough.